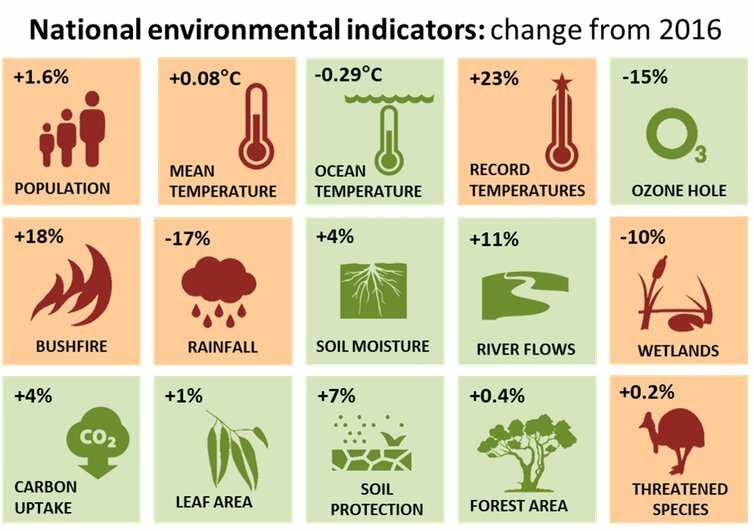 Indicators of Australia’s environment in 2017 compared to the previous year. Similar to national economic indicators they provide a summary, but also hide regional variations, complex interactions and long-term context. While rainfall conditions were generally good across Australia in 2017, record-breaking temperatures stressed our ecosystems on land and sea, according to our annual environmental scorecard. Unfortunately, it looks like those records will be broken again next year – and again in the years after that. Our terrestrial environment has done relatively well in 2017, mainly thanks to good rainfall and leftover soil moisture from the year before. However, such a short summary for a country the size of a continent is bound to hide large regional differences. 2017 was no exception. Western Australia and the Northern Territory received good rains, with vegetation growth, river flows and wetland area all coming in above average. By contrast, Queensland and particularly New South Wales saw a reversal of the previous year's gains. There was good news and bad news for our atmosphere in 2017. Humanity's collective action to fix the hole in the ozone layer is proving successful. The hole is the smallest it has been since 1988. On the other hand, global carbon dioxide concentrations rose again, by 0.5%. While this was less than in the previous two years, it was still far from enough to stop accelerating global warming. Globally, 2017 was the second-warmest year on record after 2016. It was the third-warmest year for Australia, and the hottest year on record in southern Queensland. These statistics are all the more remarkable because 2017 was not an El Niño year, during which high temperatures more commonly occur. Wooden church- an 'ephemeral cathedral' could go up as Notre-Dame is restored Paris, France, Apr 19, 2019 / 08:02 am (CNA). Breakthrough Breaks through Christian Movie Stereotypes Breakthrough might challenge some of our stereotypes of Christian films.